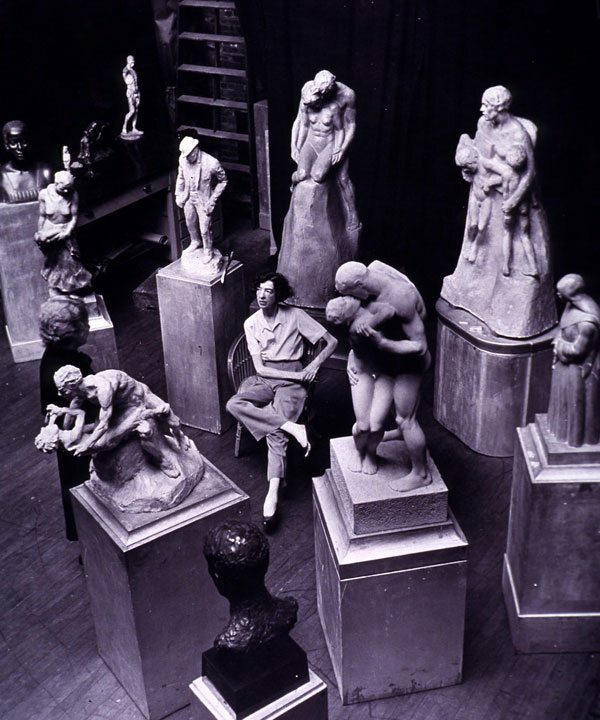 Gertrude Vanderbilt Whitney in her New York studio. Whitney is an instrumental figure in the Center’s history. During the fall of 1925, the International Cody Family Association was formed at the Drake Hotel in Chicago, initiated by Mary Jester Allen. At this organizational meeting she made her proposal for a Buffalo Bill Memorial Museum and appealed for “family relics.” The new association also discussed plans to have Buffalo Bill exhumed and reburied in Cody. Allen was described as “chairman and an enthusiastic promoter of a plan to gather, in the old homestead in Cody, Wyoming, all possible relics of the famous frontiersman, which will tell his history and likewise that of the period when he became famous.” Allen may have been the only family member who wanted to locate the museum in Cody. The Buffalo Bill Museum’s first home, a log structure at 836 Sheridan Avenue, began to take form early in 1927, a prosperous year in America. Planned as “an exact replica in design” of Buffalo Bill’s TE Ranch house, except for the fact that its dimensions (50 x 70 feet) were considerably larger, it blended in well with the town’s rustic atmosphere and was typical of western architectural design. It had seven large rooms, two halls, two public lavatories, three closets, a scrub room, two big stone fireplaces, two smaller fireplaces, and two porches. An integral unit of the Buffalo Bill Historical Center, the Draper Museum of Natural History, opened to great acclaim in June 2002 and creates, accumulates, and disseminates knowledge about the natural environment and human cultures of the American West, focusing on the Greater Yellowstone region. 1. Bartlett, Richard A. 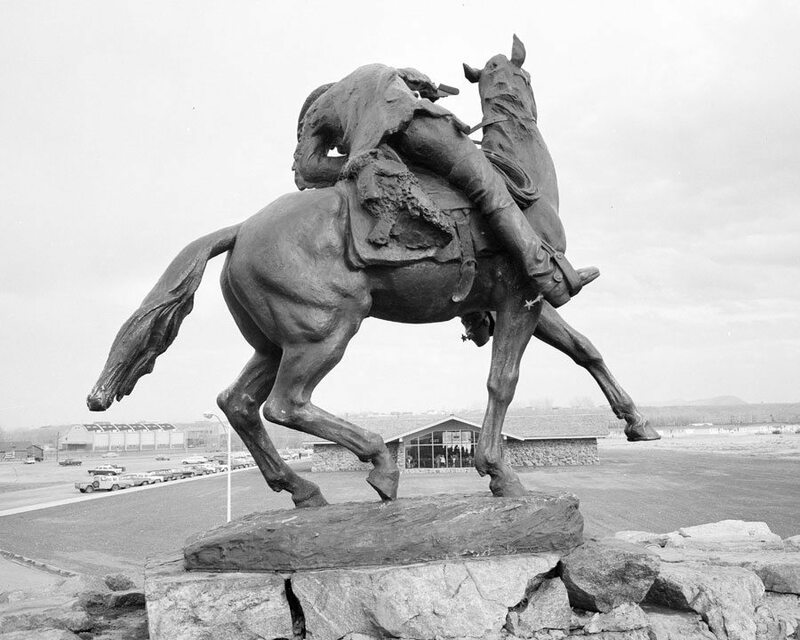 From Cody to the World: The First Seventy-Five Years of the Buffalo Bill Memorial Association. Cody, Wyoming: The Buffalo Bill Historical Center, 1992, pp. 23, 24. 3. Ibid., pp. 22, 23. 4. Ibid., p. 22; Yost, Nellie Snyder. Buffalo Bill: His Family, Friends, Fame, Failures, and Fortunes. Chicago: The Swallow Press Inc., 1980, p. 403; Russell, Don. The Lives and Legends of Buffalo Bill. Norman, Oklahoma: University of Oklahoma Press, 1960, p. 469. 7. Bartlett, Richard A. From Cody to the World: The First Seventy-Five Years of the Buffalo Bill Memorial Association, pp. 44, 45, 55. 8. Ibid., pp. 59 – 61. 10. Ibid., p. 68, 69. 11. Ibid, pp. 111, 112, 118, 119. 13. Ibid., p. 121, 122. 14. Ibid., p. 75, 105, 106. 15. Visitor’s Guide, Buffalo Bill Historical Center, Cody, Wyoming, 2001. 21. Bartlett, Richard A. From Cody to the World: The First Seventy-Five Years of the Buffalo Bill Memorial Association, pp. 216 – 218.